Behind every successful startup, there is Good Design! 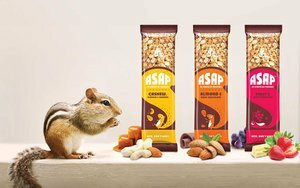 ASAP, CIIE-IIM-A incubated Bangaluru startup that created this “on the go” snack, Elephant design helped strategise and communicate a differentiating visual story. Last few years, India has seen a steady rise in design consulting needs from new mushrooming businesses, commonly referred as ‘Startups’. These are not necessarily the love child of newbies but also some industry veterans or serial entrepreneurs taking on new business challenges, who understands the importance of design. Here, Ashish Deshpande explains the pros & cons of designing for startups. A motivating enterprise environment in India, propelled by several industry & government initiatives has helped create a breed of entrepreneurs high on enthusiasm, technology savvy and willing to take the risk on new product service formats. Design is playing a crucial role in their journey as well as successes and there is increasing acceptance to the use of design in building a resounding brand & quality of product or service application. Paperboat is great example of a recent startup success story where one can observe design playing a key role. However, working with startups has its own unique hiccups and thrills. Let’s face it! Startups are ultra lean. Aligning business & technology solutions to a consumer-focused approach needs to be done at multiple levels. Since most startups, unlike the well-established corporate world, cannot afford multiple experts & agencies, a designer is seen as a ‘fix all’ for several needs. Involvement of a designer or design firm goes beyond a specific design assignment. Designer ends up playing a strategic role, trying to balance business strategy with design, brand image, product, pack, quality, vendor development, applications and point of sale, with key design language & marketing messages. Most startups are either technology or business focused. Design is a weakness and so is the ability to profile and understand end consumer. Startups tend to get committed too early to a particular tech or proposition without ascertaining appropriateness, uniqueness and distinction of their offering. Despite a new idea, most times, the end offering is neither distinct enough, nor is perceived value appreciable. This grave omission places the fledging business at risk from the word go. Paucity of key in-house expertise & resources, especially funds, forces design to be undertaken in an incremental manner, stretching across months at times. Design implementation also takes place at a slow pace so it is difficult to see the full picture or measure the impact of design. A healthcare start up, setting up new format of hospitals launched the service care product with just the new brand identity, However, the hospital experience that would resonate with the brand was placed on hold due to lack of funds. The result was apparent. Customers never experienced the distinction in the hospital value proposition and never understood as to why they should adopt this new hospital chain. SynPhNe. Singapore based technology startup where design helped cutting edge tech become human through Industrial Design of Wearable stroke rehabilitation device focused on needs of patients. Startups are a happy lot. Usual work culture is hands-on and people come across eager to learn, share and help. It is great to work with synergies of such teams and be part of an exciting journey. The results reflect on the design output. Client meetings are less of drudgery, are participative and consequently more productive. This is one place where Startups score. They are willing to play along as you explore, experiment & test. There is negligible blame game, no departmental silos or ‘mother of all’ presentation to the King of the corporate. Results are quick and decisions are usually part of a co-creative play. Funds are the only constraint but then frugal approach and ‘jugaad’ prototypes are more than welcome. This approach works wonders for the confidence of the design team. Many startups are working in the healthcare, social impact, agri-tech and energy space. Just the sense of what your work will potentially achieve can layer the designer in you with goose bumps. Each startup is a new challenge, whether it is B2B or B2C, it gives a sense of new purpose and when design helps enable such opportunities, the result is very satisfying. Design as core to startups is understood by the fact that many new enterprises have designers as co founders. Designers in India will have to quickly adapt to this new scenario and draw out a process to work with the Startup eco system. This culture is here to stay.